Home > Vitamins & Food > Are Vitamin Enriched Soft Drinks Worth the Money? Many drinks are advertised as ‘vitamin enriched’, which makes them seem healthier. But are they healthier or just more expensive, and are they really worth the extra money, or is it just a marketing ruse? Are The Added Vitamins Necessary? For most people, unless they have a nutritional disorder or are eating a very restricted diet, drinks with extra vitamins aren’t necessary, as they can get all the vitamins and minerals they need from a healthy, varied and balanced diet that includes plenty of fresh fruit and vegetables, with low fat sources of protein. Is It A Marketing Ruse? Some people may be attracted to a drink just because it says that it has added vitamins, but it may actually not be any healthier than the non-vitamin-enriched version, while probably being a lot more expensive. Even though drinks may say ‘vitamin-enriched’, it’s worth checking the label for the actual amounts, as the levels of added vitamins might not be high enough to make a significant difference (see also 'Are Vitamin Enriched Sweets and Snacks Worth the Money?'). One thing to be aware of is that many drinks make an issue of the fact that they have added vitamin C (often listed as ascorbic acid). Generally, this isn’t added to boost the vitamin content but is used as a safe and effective antioxidant, which helps to keep the drink fresh. What Else Is In The Drink? As well as checking the label for the levels of vitamins, it’s worth checking to see the other ingredients as well. Drinks that are labelled as vitamin enriched can still be high in artificial flavours, colours, preservatives, sweeteners and other additives. Drinks with added vitamins, including those labelled as ‘vitamin-enriched water’, can be very high in sugar, which is damaging both to the teeth and to the waistline. Some vitamin-enriched and energy drinks can also have added caffeine, which can cause problems with sleep, anxiety and concentration, especially in children. 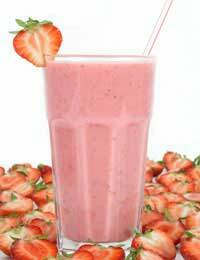 Fruit juices and smoothies are naturally high in vitamins, and count as one portion of the recommended five a day. They are quite high in natural sugars and are acidic, so drinking too much fruit juice can be harmful to the teeth. To protect teeth, try drinking fruit juice with a meal, or having a fruit smoothie instead of a pudding. Milk is high in vitamins A and D and calcium. Adults and children over five can drink skimmed milk, while children between one and two should have full fat milk, and children from two to five can move to semi-skimmed milk. A cheaper and healthier alternative to vitamin-enriched water is to add a few drops of lemon juice to plain tap water (which is cheaper and far more environmentally friendly than bottled water), drop in a slice of lemon or lime, or add fruit juice or high-juice squash. While water is one of the healthiest drinks there is, watch out for bottled water, whether vitamin enriched or not. Bottling and shipping water uses up a lot of valuable resources and produces a lot of plastic waste that often ends up in landfill.